Why Choose Gas Snow Throwers? Gas snow throwers are a must for heavy winter conditions. There comes a time when you simply cannot keep up with all the snow that has built up in your driveway or parking lot. Your customers will appreciate your efforts in keeping your business parking lot clean and you can also use the machine to clear your own driveway. What makes a gas machine so convenient? Can use it anywhere: You can take a gasoline machine anywhere. You do not have to hassle with cords or electrical outlets. No cord damage: There isn’t any danger of cord damage when you use gasoline. Clear a larger area: You can clear a large area, like your business parking lot with gas snow thrower. Easier maneuverability: A gasoline machine can maneuver better without an electric cord. There are a number of machines available. They all come with a 2 year warranty. Single stage 21”: this gas snow thrower is a compact machine with a 4 cycle engine. It has a push start button that is user friendly and convenient. The starter has a mitten grip that makes it easy to hold when using winter gloves. Two stages larger 26”: this gas snow thrower is more powerful they can clear a 26” area. You can steer it with one hand so that your other hand is free to handle the direction of the chute. It also has a dashboard light for when visibility is bad. Two stages deluxe 28”: this machine is the very powerful and is able to clear a 28” area. It is also able to be steered with one hand and has a dashboard light. It also has heated hand grips and reflectors. This is ideal for smaller commercial parking lots. Two stages deluxe 30”: this gas snow thrower has the wider range and is able to clear 30”of snow at a time. They have touch-and-turn steering for added maneuverability. They also have the dashboard lights and heated handles. There is also a slightly less powerful model that has special SelecTrac Drive for clearing icy conditions. Deluxe two stages 45”: this is the most powerful machine and is able to clear 45” of snow at a time. This is good for larger commercial parking lots. You can also clear extensive driveways with this machine. With all these models at your disposal you can choose the right gas snow throwers for your needs. As you can see they can be used for residential driveways or larger commercial parking lots. 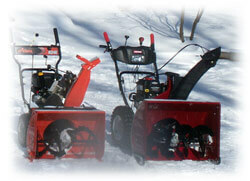 We also offer a variety of electric snow throwers for your convenience. Great for small residential jobs these machines save you time and energy. Gives instant heat to help warm up any area that you choose.